Another new high mark for the Clawbies in 2010: more than 50 tweeted mentions and nominations, in addition to the blog post nominations noted below. I won't republish all the twitter entries, but would like to continue my personal tradition of gathering the blogged nominations. Similar to last year, if you've blogged an endorsement of three fellow Canadian law bloggers, please drop me a note. I'll update this post a few times before we announce the winners on New Year's Eve. Many thanks to everyone who's taken the time to participate! Noted by Simon Fodden at Slaw yesterday, Tara Calishain at ResearchBuzz has a roundup of Google's Around operator. The protocol is "AROUND(x), where x is the maximum distance between two search terms." Just a quick note to welcome Stem client Waterstone Law to the blogosphere. 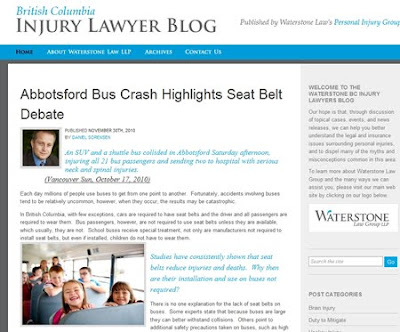 The firm's ICBC and Personal Injury groups launched the BC Injury Lawyers Blog last week. Congratulations & best blogging wishes! Jordan Furlong has a post up at Stem this morning, but I wanted to add my personal support to the new website Attorney at Work, which launched earlier today. The idea behind this site is to give practicing lawyers "one really good idea every day" through their emailed daily dispatch. The content is intentionally styled in a short and factual manner, and intended to deliver each day's idea as succinctly as possible. AAW is the brought to us by the team of Merrilyn Astin Tarlton, Joan Feldman and Mark Feldman. And full disclosure, both Jordan and myself are helping out. My first submission on the use of RSS readers is also published on the site. There are more than 100 experts who have committed to contributing, and an advisory group that looks very strong. But most of all, I'm confident we can depend on Merrilyn, Joan and Mark to deliver the hard work and ongoing commitment required to make a project like this successful. As always, daily updates to BC legislation are available at www.bclegislation.ca.